Health drink has lot of benefits for young kids and even adults. It’s always advisable to prefer homemade health drinks than packaged, artificial synthetic drink that are being sold in market which claims to make them strong , tall and sharp!!! So I am here with a homemade health drink for toddlers made from this malted cereal mix. This is very easy to prepare when you have this malted cereal mix in hand. It’s tasty, healthy and filling too. 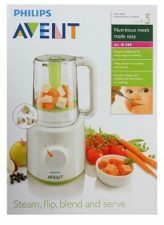 It provides energy to the growing toddlers and helps in healthy weight gain too. 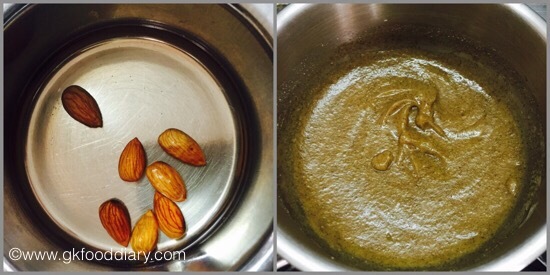 Let’s check how to make this Badam ragi green gram malt for toddlers. 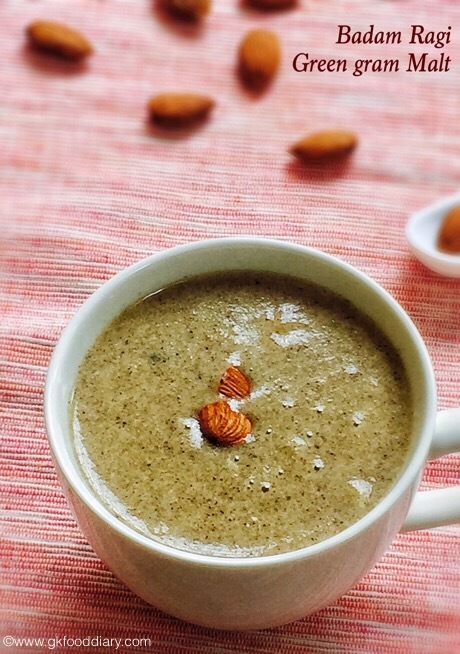 Badam Ragi Green Gram Malt - Health Drink for toddlers with rice+ragi+green gram malt and almonds. Boil milk in a sauce pan and keep it ready. Keep all the ingredients ready. Take 2 tbsp of malted cereal mix and add ½ cup of water to it. Cook the malted cereal in medium flame for 3 minutes or until it gets cooked completely and becomes shiny. Stir it continuously while cooking otherwise it may stick to the vessel. In the meantime soak the almonds in hot water for 5 minutes and peel the skin off. 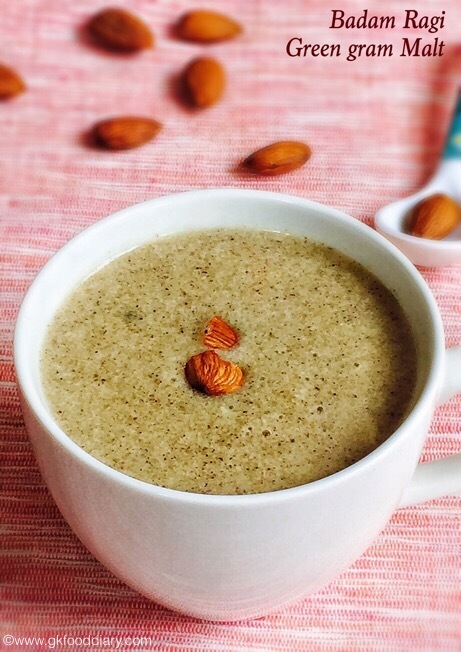 Dry roast the peeled almonds for a minute and grind it to a fine powder using a blender. Once the malted cereal is completely cooked, add almond powder. Mix well.Now Add ¾ cup of milk now to the cooked malted cereal mix. Boil it for 5 more minutes or until rolling boil. Remove from flame once done and cool it down. The malt drink becomes thick after cooling down. So switch off the flame accordingly. 1. 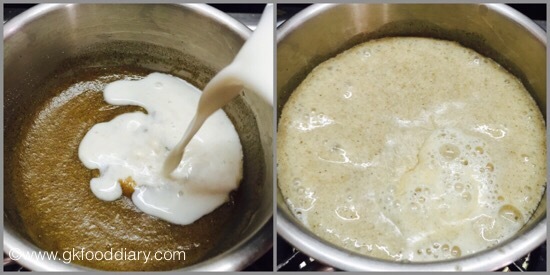 Boil milk in a sauce pan and keep it ready. 1. Keep all the ingredients ready. 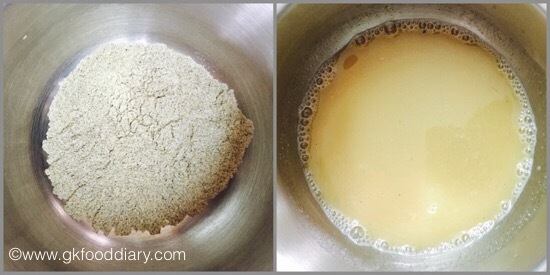 Take 2 tbsp of malted cereal mix and add 1/2 cup of water to it. 2. Cook the malted cereal in medium flame for 3 minutes or until it gets cooked completely and becomes shiny. Stir it continuously while cooking otherwise it may stick to the vessel. In the meantime soak the almonds in hot water for 5 minutes and peel the skin off. 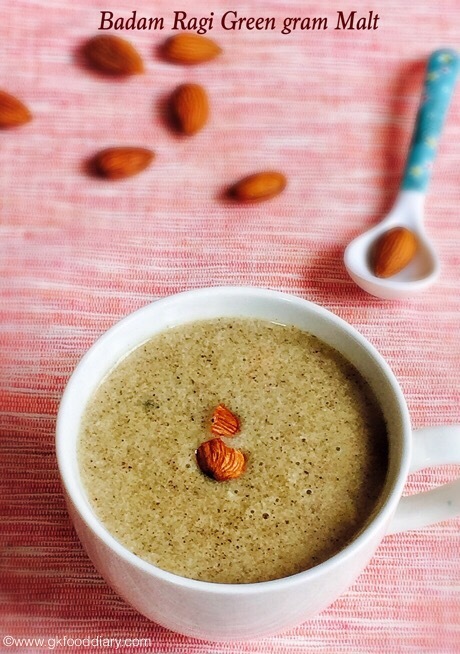 Dry roast the peeled almonds for a minute and grind it to a fine powder using a blender. Tasty and healthy Badam Ragi green gram malt is ready to feed your toddler. 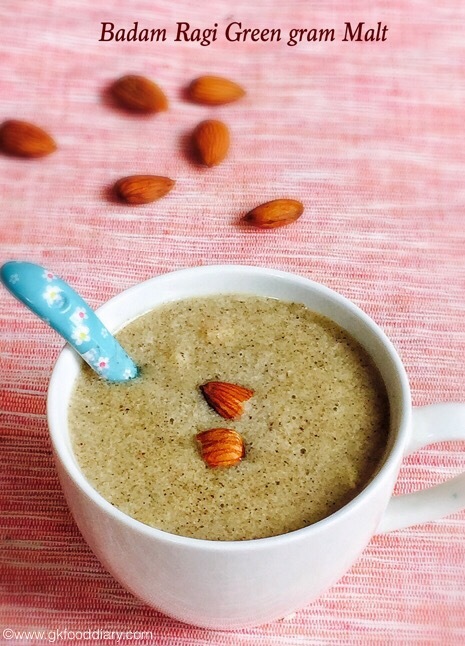 Make sure to powder the almonds finely if your toddler can’t chew them. The consistency of this drink should be pouring and it tastes when served hot. Generally this malted cereal mix doesn’t cause any allergies, but check for symptoms and stop feeding your baby if you find any. This malted drink becomes thick when cooled down. So switch off the flame when it is little watery.